Xcode’s Symbol navigator allows you to browse through the symbols in your project — just click the Symbol button on the Navigator selector bar. Note that you need to wait until Xcode finishes indexing your project before you can use this feature. You can display symbols in a hierarchical or flat list using the buttons at the top of the Symbol navigator. The first button on the Symbol navigator shows only class symbols and hides global symbol types. The middle button shows only symbols in this project. The third button shows only containers (classes and categories). You can refine the Results list still more by entering text in the Filter field at the bottom of the navigator. If you select a symbol to display, its header file definition will be displayed in the source editor. In this figure, the app developer has hidden everything but the member symbols. In the resulting list, the developer selected the RTDetailViewController viewDidLoad method, and its definition was highlighted in the source editor. 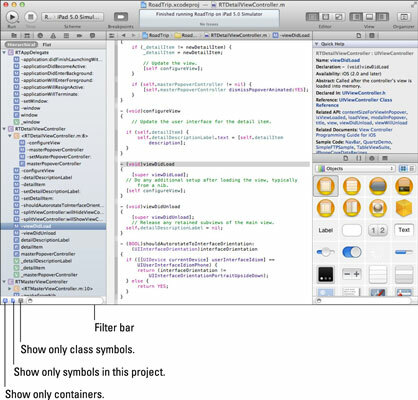 The Symbol navigator in Xcode.